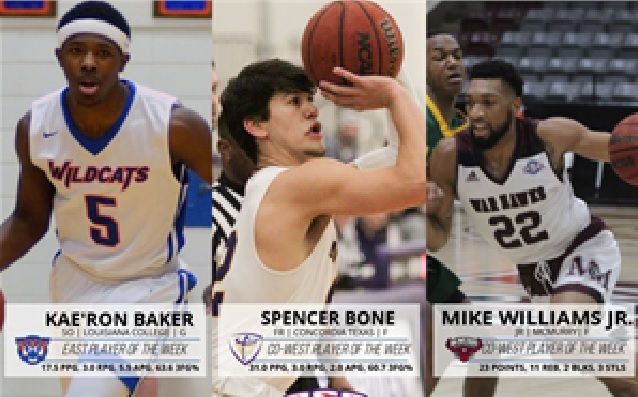 Louisiana College sophomore guard Kae’ron Baker (Navasota, Texas) led the Wildcats to a pair of conference wins, averaging 17.5 points, 5.5 assists and 3.0 rebounds per game while shooting 12-of 21 (57.1 percent) from the field and 7-of-11 (63.6 percent) from beyond the arc. He was a crucial part of LC setting a new team record for field goal percentage (70.5) in a 112-72 victory over Belhaven with 14 points and five assists. Baker made clutch shots late in a 77-73 home win against UT Dallas, en route to 21 points to go with six assists, and tying the Wildcats with the Wildcats for first place in the ASC East Division. Concordia Texas freshman forward Spencer Bone (Cibolo, Texas) shot over 60 percent (17-of-28) from three-point range in the Tornados’ two road wins. In a 112-109 win at Sul Ross State, Bone knocked down seven three-pointers on his way to a team-high 26 points, helping CTX rally from a 14-point second half deficit. On Saturday, he hit ten three-points, scoring a season-high 36 points in the Tornados’ 87-79 win at Howard Payne. For the week, Bone averaged 31.0 points, 3.0 rebounds and 2.0 assists per game. McMurry junior forward Mike Williams Jr. (Houston, Texas) tied his season high with 23 points in the War Hawks 75-71 win at Hardin-Simmons. He was 10-for-14 from the field, including the go-ahead dunk with less than a minute left in the game. Williams also recorded 11 rebounds, three steals and two blocks in the victory. LeTourneau senior forward Caleb Loggins (Lewisville, Texas) recorded 17.5 points, 12 rebounds, 2.0 assists and 3.5 blocks per game as the YellowJackets split a pair of road games. He logged 37 minutes and scored with points and grabbed 12 rebounds with a couple of blocks to help LETU overcome a 15-point halftime deficit before falling in the final minutes at Ozarks. Loggins followed with a 20-point, 12-rebound, five-block performance in an 82-68 victory at UT-Tyler. Ozarks sophomore guard Ethan Bowman (Ozark, Ark.) helped the Eagles to their first two-game ASC sweep of the season with wins over LeTourneau and East Texas Baptist. He opened the week with 18 points on 7-of-9 shooting in a loss at UT Tyler. In an 81-75 victory over the YellowJackets, Bowman made a clutch shot with 32 seconds left to give the Eagles a three-point cushion. To cap the week, he poured in 17 points in a 95-83 win over the Tigers, hitting 11-of-12 from the free throw line. For the week, Bowman was 15-of-16 from the line and averaged 14.7 points and 5.7 rebounds per game. East Texas Baptist junior forward Robby Dooley (Bossier City, La.) helped the Tigers split on the road as he averaged 25.0 points, 5.5 rebounds, 3.5 assists and 2.5 steals per game. He also shot 60.6 percent (20-of-33) from the field and 90.9 percent (10-of-11) from the free throw line. In an 88-78 win at UT Tyler, Dooley posted 22 points, seven boards, and three assists. He followed with 28 points, four assists and three steals in a loss at Ozarks. Belhaven junior guard Justin Jones (Hollday, Utah) averaged 13.7 points per game and shot 60.9 percent (14-of-23) as the Blazers went 1-2 on the week. He scored a season-high 18 points in a loss to UT Dallas and had 15 points in a 75-71 overtime victory at MUW. UT Dallas junior guard Dimitrius Underwood (Mesquite, Texas) averaged a double of 23.5 points 11.5 rebounds as the Comets split a pair of road games to close out the first half of ASC East play. He recorded his eighth straight 20-point game Thursday with 29 points while adding 12 rebounds in a 72-71 come-from-behind win at Belhaven. Underwood then had 17 points and 11 boards for his ASC-leading 10th double-double of the year in a loss at Louisiana College. Mary Hardin-Baylor senior guard Demarius Cress (Killeen, Texas) led the Cru in scoring in a pair of wins, averaging 20.5 points per game to go with 3.0 rebounds and 2.5 assists. He shot 56 percent (14-of-25) from the floor as well. Cress poured in a game-high 25 in a two-point loss at Sul Ross State on Saturday. Howard Payne senior guard Shadd Cole (Stephenville, Texas) scored a career-high 33 points on 11-of-19 shooting, including 5-of-7 from behind the arc in a loss to Concordia Texas. In two games, Cole averaged 24.0 points and 5.5 rebounds per contest. UT Dallas junior guard Victoria Pena (Helotes, Texas) averaged 24.0 points per game while shooting 52.4 percent (11-of-21) from three-point range as the No. 23 Comets picked up two divisional road victories. In Saturday’s 78-57 win at Louisiana College, Pena was 9-for-16 from beyond the arc for a career-high 35 points. She was 11-for-24 overall, and a set a program record for three-point attempts and had six rebounds, four assists, and three steals. Earlier in the week, Pena had 13 points and five assists in just 22 minutes in a 74-36 victory at Belhaven. It is her fifth career Player of the Week award. 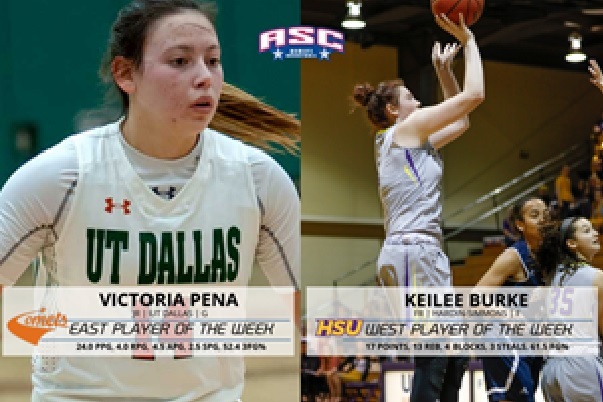 Hardin-Simmons freshman forward Keilee Burke (Belton, Texas) scored a season-best 17 points, hauled in 13 rebounds, blocked four shots and had three steals as the Cowgirls won their fourth straight game, a 72-64 victory over McMurry on Saturday. Burke shot 8-of-13 from the floor in the game. Louisiana College senior guard Kourtney McGhee (Simmesport, La.) finished with 13.5 points, 3.0 rebounds, 2.5 assists and 1.5 steals per game while going 15-of-19 from the free throw line as the Wildcats went 1-1 on the week. Belhaven senior forward Lauren Brooks (Jackson, Miss.) had a career-high 23 points on 10-of-13 shooting and a season-high 20-rebounds in a 63-62 loss at Louisiana College. In two games, Brooks averaged 15.5 points and 13.5 boards, while shooting 73.7 percent (14-of-19). East Texas Baptist junior forward Kim Childress (Highlands Ranch, Colo.) was the leading scorer in both wins for the No. 14/15 Tigers, averaging 16.5 points, 5.0 rebounds, 2.5 assists and 1.5 steals per game. She posted 18 points on 7-of-13 shooting in a 69-56 win at Ozarks and had 15 points with five boards in a 72-64 victory at UT Tyler. Ozarks junior forward Delanei Stephens (Coal Hill, Ark.) averaged 13.6 points, 6.6 rebounds and 3.3 steals per game en route to a 2-1 record last week. She shot 6-of-11 from the field with 16 points in a 75-72 win at UT Tyler on Monday. In a 56-37 victory against LeTourneau, Stephens scored nine points and pulled down eight rebounds. She finished the week with 16 points and nine boards in a loss to No. 14/15 East Texas Baptist. Sul Ross State freshman forward/center Jocelyne Roque (El Paso, Texas) recorded her second double-double of the year with 15 points and 12 rebounds in a 61-60 come-from-behind win over Concordia Texas on Thursday. She then had nine points and nine boards in a loss to No. 7/9 Mary Hardin-Baylor on Saturday. For the week, Roque averaged 12.0 points and 10.5 rebounds per game. Mary Hardin-Baylor junior guard Hannah Holt (Lumberton, Texas) averaged 13.5 points, 4.0 rebounds and 2.5 assists per game in a pair of victories for the No. 7/9 Cru. She scored 15 points in a 71-46 win at Sul Ross State, then had 12 points, six boards, and three steals in a 74-69 win at Howard Payne. Howard Payne sophomore guard Chelsey Harris (Waco, Texas) had a game-high 20 points with five assists in a 61-35 victory over Concordia Texas. For the week, Harris averaged 16.5 points and went 10-of-13 from free throw line as the Lady Jackets split.